I Believe in Unicorns returns for a triumphant second season and is ready to capture the hearts and minds of audience members over the summer! I Believe in Unicorns is “an enchanting and interactive show” based on War Horse writer Michael Morpurgo’s 2005 best-selling story. No matter what age you are, you may very well leave the Vaudeville Theatre believing in unicorns too! The show is visually impressive, fast paced and packed to the brim with magic! The show is directed by Dani Parr, designed by Kate Bunce with projects by Arnim Friess, lighting by Will Evans and sound by Martin Thompson. Despite being packed to the brim with action and adventure, the show runs at 1 hr with no interval and is therefore perfect for those with shorter attention spans. 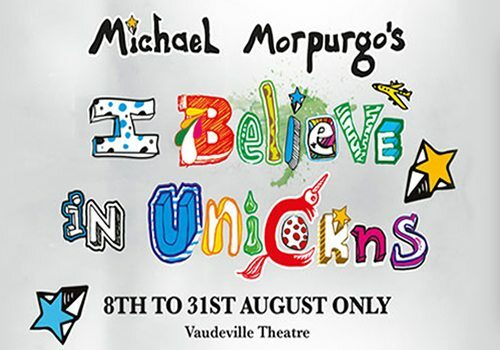 I Believe in Unicorns runs at the Vaudeville Theatre on the Strand during the day-time from 1st – 30th August. Book now to avoid disappointment. The show is perfect for children and adults alike and will capture the imagination of all age groups. The show is recommended for family outings with children aged 6 and upwards.